Because of its rose gold colour, Paeonia Etched Salmon is a popular choice. It is one of the most beautiful peonies in our assortment. 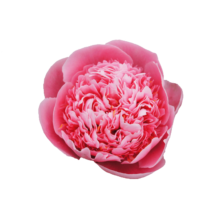 Etched Salmon is a full-petalled peony that strongly resembles a garden rose in terms of its shape. The flower has a unique colour and a certain glow because of the thousands of leaves that get darker to the centre of the bloom. This peony variety is extremely popular and only available on a limited basis. If you like beautiful shaped flowers, romantic colours and exclusive varieties, this is the peony for you. Paeonia Etched Salmon was registered in 1981 by Cousins and Klehm. In 2002 it was awarded with a gold medal by the American Peony Society. This peony variety is very popular, but only available on a limited basis. Don’t miss out!